Are These Dubai’s Weirdest Guinness World Records?! Yep, it’s a fact – Dubai loves breaking Guinness World Records. Our city is famous for being home to the world’s tallest building, the tallest tower in the world, the world’s first indoor ski slope, the world’s biggest mall – but have you heard of the other, slightly weird, Guinness World Records that Dubai holds? Thought dancing was just for humans? Think again. Dubai Police managed to bag the Guinness World Record for largest synchronised car dance, as part of National Day celebrations. Yes, there is actually a world record for this and of course it would happen in our desert. The most sand moved with a teaspoon in 30 seconds is 194 ml. Not sure how this is even possible, but we’re definitely going to try beating this one! The Dubai Police also managed to complete the world’s largest underwater puzzle, which measured 168 metres squared! Yes it’s true, and no, it wasn’t during Halloween. The Dubai Health Authority managed to get 691 people together, all dressed as nurses back in 2014. Karak chai, anyone? 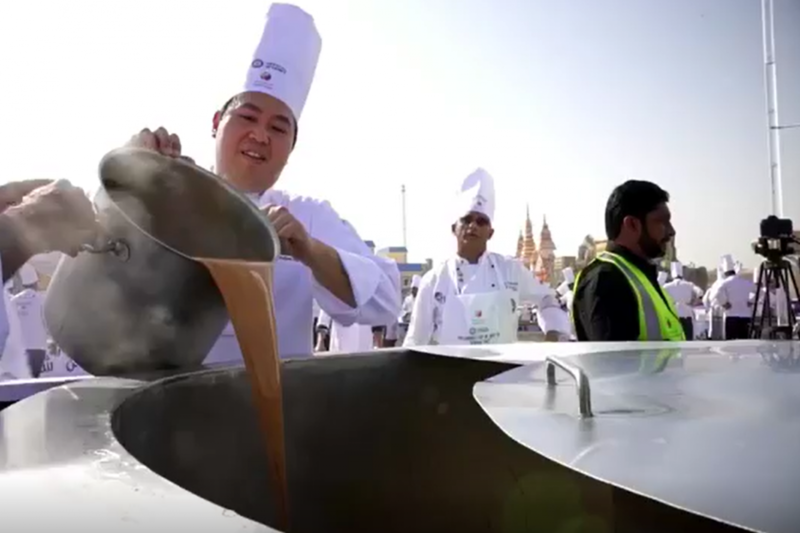 The Guinness World Record for the largest cup of hot tea was just achieved earlier this year at Global Village! The 3.6 metre high tea cup had 5,000 litres of tea, and was 85 degrees Celsius! In the run up to the launch of the latest Maze Runner film, Novo Cinemas rounded up 301 people to create the world’s largest human maze! The world’s tallest chocolate sculpture is a 13.52 metre tall replica of the world’s tallest building – the Burj Khalifa! It was unveiled at Dubai International Airport, and was made entirely of Belgian chocolate.. yumm! Yep, we’re not surprised the world’s longest gold chain is made in Dubai, but can you guess how long it is?! Made entirely of 22-carat gold, the chain measures 5.5 km! That’s more than 6 times the size of the Burj Khalifa! Definitely one of the weirdest Guinness World Records Dubai holds. The fastest time ever to complete a game of Operation is 21.87 seconds – and it took place at Global Village. Think you can beat it? Not sure why anyone would try to beat this, but Dubai also holds the Guinness World Records for most burpees in 24 hours! Eva Clarke (somehow) managed to do 12,003 burpees at the Dubai Autodrome, to raise money for charity. ..and it’s shaped like an airplane! The Guinness World Record for World’s largest floral installation was achieved by Dubai Miracle Garden just two years ago, as they created an incredible Emirates A380 Airbus using over 500,000 flowers! Read more: You can visit the rooftop of the world’s tallest hotel in Dubai, or check out this video of the world’s largest aerial projection screen in Dubai..